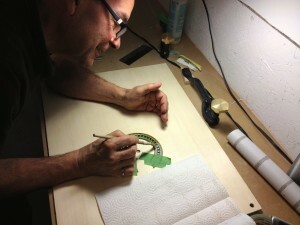 The rosette is one of the fundamental artistic methods of expression for a guitar maker. Like so many structural features in lutherie, no component of a guitar is built purely for showing off – there will always be a very good (acoustic) reason for why we do things the way we do. For example, the rosette acts like a frame and stabilizes the sound hole of the guitar. The documentation below provides a little insight into the assembly of a Rosette. Chris is building a modern rosette out of solid Ziricote wood. The pieces come from the excess material from one of my guitars, and we joined them to create one piece large enough to accommodate this rosette. Chris will be lining the rosette with a few veneers on the outside and inside edge; even the minimal use of veneer strips has a significant effect of literally framing the picture of the Ziricote grain. Vic is combining pre-fabricated wheatear strips (see center of the rosette) with his own choice of dyed veneers. The result is a very classy looking hand-made rosette, which has the most time-exhausting components already supplied to the student. Vic’s rosette illustrates that the use of pre-fab materials doesn’t mean at all that the final result has a generic appearance. In fact, Vic was able to use the time he saved by ordering the wheatear strips, and explore in detail what different combinations and layouts of dyed veneers look like. The result is a very balanced, calm yet creative rosette pattern. Tom selected a very ambitious project, especially for a student – he is building a copy of the Torres FE 18 by Antonio de Torres. His work included dyeing veneers following recipes I developed during my research, and making many veneers from “scratch”. He spent many hours sanding and planing veneer that we had cut from solid blocks of wood, and then turned them into veneer strips he inlayed into his rosette. The gallery below shows the rosette in “dry assembly”, the last stage where we verify that everything lines up properly. The next stage will be to saturate the spruce top with French polish, and then glue the rosette in with hide glue. All pieces are put into place without glue, and once the dry assembly is finished it gets flooded with glue. Once the glue is dry, all pieces are secured and the Rosette can be planed flush with the top.